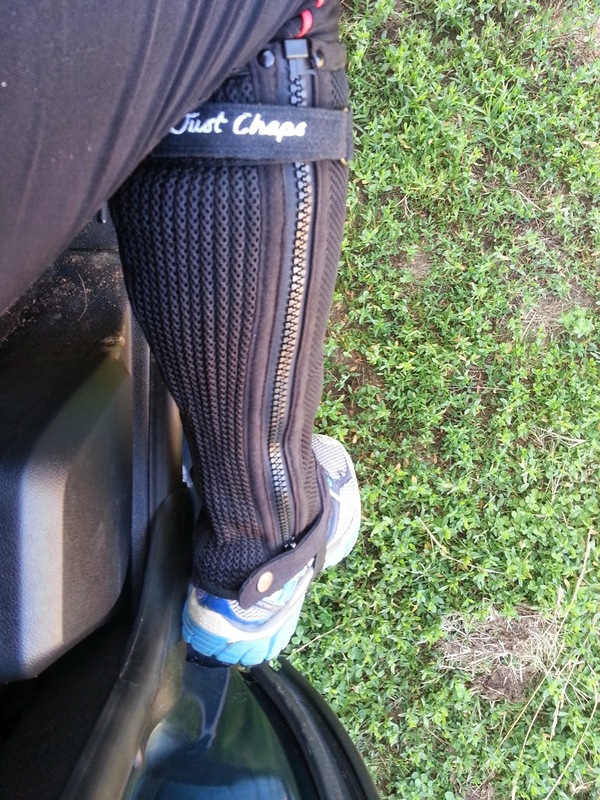 The new Just Chaps neoprene mesh half chaps arrived quicker than I thought with free shipping. Yay! I was really worried the size wouldn't work. I always seem to measure in the calf for one size and in length for another. But I chose to go with a small and hoped it worked. I got to test them out on Sunday on a shorter than planned trail ride. The material is very soft and super light weight. I was worried that they would be too long especially since my other pair were made so that the outer rim was longer versus the inside. These are the same length all around. But I needn't have worried because they fit just fine for the length. What I should have done was wear one of the old ones on one leg and the new ones on the other so that I could compare how they felt while I rode. I didn't think of that until I was half way down the trail though. Oh well. Initial impressions were that they are very soft, light and flexible. The elastic at the bottom that goes over the shoe is the perfect length to fit over my running shoes without being too taut or loose, so that is a big bonus. The shoe end is a little narrow making the stretch over the running shoe a bit tight, but I found that with my old ones as well. They just aren't made to go over the bulk of a running shoe with the laces and all. It did fit though and I was able to button up the bottom as well, so it wasn't an issue. I really like the extra Velcro strap at the top. It allows you to make it slightly more custom fitting since you can make the calf tighter or a little looser depending on how you set the strap. Plus it has the logo on it which is kind of nice. I am really bummed they only are black. It blends too well with my riding tights, but that is a completely cosmetic and useless observation in the end. Other things to note: the zipper moved smoothly, but is plastic. While that is lighter weight, it also isn't the best material. I like metal zippers better. Also, the fake suede inner calf patch is very small and incredibly thin. Not sure what the actual point of it is. They did feel pretty tight over all. I think this was a combination of freshly washed riding tights and the fact that they are brand new versus my old ones which have been around since 2009 and are very stretched out. During the ride, my left foot kept falling asleep and I kept feeling something bunched up behind my left knee. I checked and it wasn't the rim of the chap, but was my riding tight which has never happened before. So either I didn't pull them down enough or something with the chap and the tights wasn't working out so hot. Or it could have been that my stirrups for some reason felt short and my leg felt jammed up. I wont say they are causing an issue until it has happened more than once. 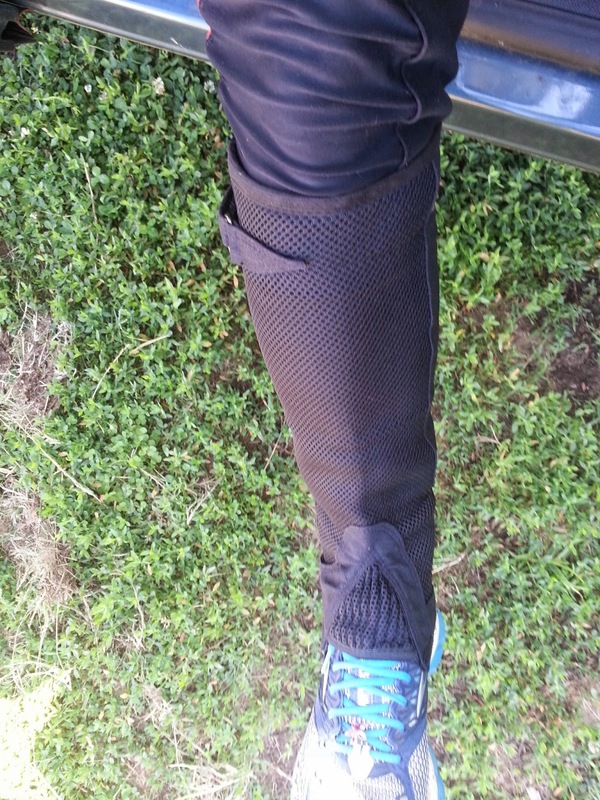 I was expecting some super refreshingly cool breeze on my calf during the ride since they are mesh and that was the big selling feature. I didn't. They weren't any hotter than my all leather ones, but I don't really think they were any cooler either. This is where wearing one type on each leg would have helped to compare how sweaty and hot my legs were at the end of the ride. At the end of the day, I'm giving these chaps a B+. They were comfortable and light weight and fit really well in length and width. They clasped shut over the running shoe which isn't something all chaps can do. I wasn't noticing any cooling effects, so minus points for that claim. But...overall I am concerned that they won't hold up all that well. They just seem kind of....flimsy for being endurance gear. 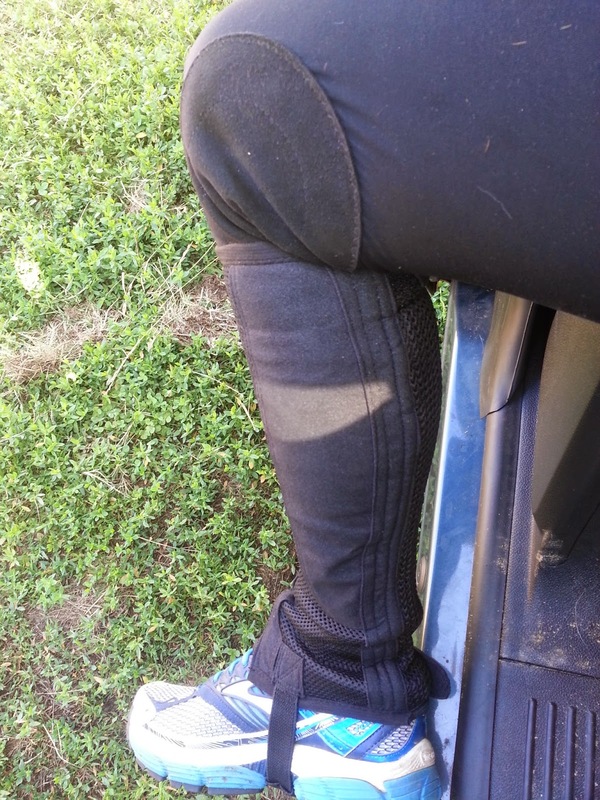 My Ovation leather half chaps have been on every ride I have ever taken (arena work, jumping, trails, endurance rides, hunter paces etc...) since 2009 and the only wear is to the stitching on the inner calf patch. I highly doubt these will last even half that long, but we will see. Neoprene is pretty tough material, but I'm not super convinced. Time will tell if they were worth the $75 or not. My Ovation ones were $35 in 2009.